As I spend more and more time with my own clients helping them create their dream spaces, I’m developing a stronger and stronger desire to have my own perfect space. Over the years since my first “big girl” apartment in college I have had many different apartments and many different roommates. I think from the time I had my first apartment until moving into my current place (which I can’t believe has been 15 years?!!) I moved at least once a year. My boxes would barely be unpacked before I was looking for a new place. For the longest time I had roommates, plenty of whom were completely crazy, which is funny because I would always tell people that I had pretty good luck finding good roommates on craigslist, and then whatever friend I’m with immediately points out the reality that, haven’t I had like pretty much all super crazy roommates? Awkward silence… oh, yeah… actually… and then we laugh about all the crazy and how many awesome and hilarious stories that I have from them. So in a way, thanks craigslist! Anyway, during ‘The Great Recession’ I was unemployed, creatively employed, and employed but living in an expensive city I couldn’t afford, for a total of about three years. So until fairly recently the roommates and cheap rent were non-negotiables. In 2012 I finally found a permanent job back in Chicago (where I never wanted to leave to begin with) and gleefully moved back… but still into an apartment with two roommates. And about six months after that, I decided that no matter what – my days of having roommates needed to end. I think I might just inherently be a cheap renter, or I might just be really good at finding good deals on cute places… who knows, but one thing I knew for sure was that I couldn’t share my space with people who I hadn’t personally invited over anymore. Since I was just starting to recover from the past few years of pure survival, I was on a pretty tight budget and I knew that I would have to get cozy with the idea of a small space if I wanted to have any hope of being by myself, and being in a neighborhood I actually liked. So now I have my very own – very tiny – space, it might be small, but it’s packed with lots of personality and it is BLISS. While I try to dig up pictures of my space from when I first moved in, including the underwhelming paint job, here is the floor plan. 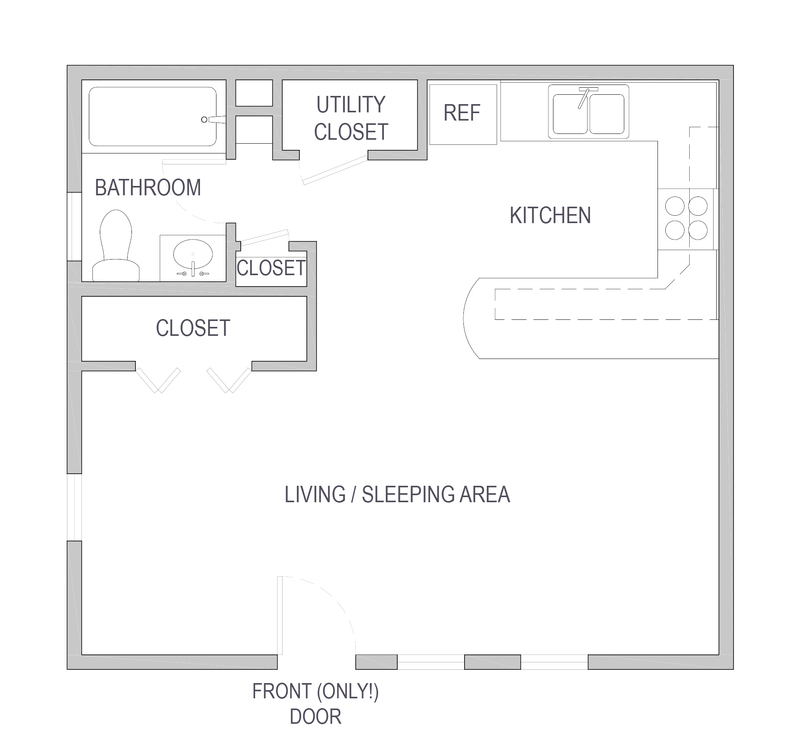 I might be biased, but (in my professional opinion) it’s a great layout for small space living and feels much larger than the modest 425sf it actually is!